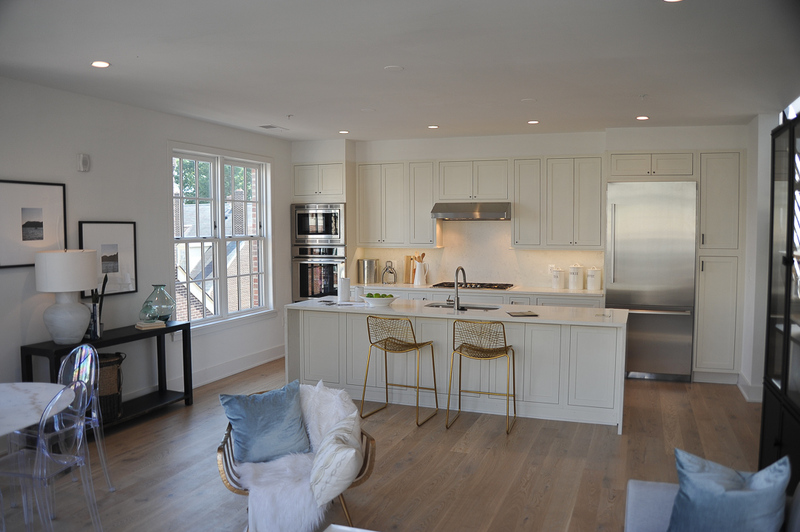 Tom and Susan had the opportunity to check out a new condo building in the heart of Old Town Alexandria called Bottling House recently. There will be a total of seven beautifully-appointed contemporary-style units, with four still available. Check out the view from the rooftop deck of one of the penthouse units! The condos at Bottling House have all been impeccably designed, with careful attention to detail at every turn. Built by McWilliams Ballard, the open floor plans are filled with designer touches and lots of light. Here are the details on the units still available for purchase. The one bedroom/one bath is priced at $350,000, the two bedroom/one and a half bath is $725,000 and two penthouses are $1.5 million and $1.7 million. Square footage is as follows: Unit 001: 471, Unit 101: 1,016, Unit 301: 1,770 and Unit 302: 2,028. Just a few of the many stylish features include: 6-inch wide white oak hardwood flooring, custom soft-close kitchen cabinets with inset shaker doors, quartz countertops, Bosch and Thermador stainless steel appliances, Porcelanosa tile bathrooms, Nest thermostats and energy efficient LED recessed lighting. The penthouses come with rooftop decks, which are pre-wired for exterior speakers, and have natural gas piping, plumbing for sink and electrical rough-ins for easy installation of an outdoor kitchen. Bottling House is located at 521 North Washington Street, right near everything Old Town Alexandria has to offer. It is super close to Trader Joe’s, fun shops and restaurants, and of course the Potomac River. Are you thinking about moving to our area? We would be more than happy to assist you, whether you need to buy or sell. Call us at 703-822-0207 or e-mail us at tomandcindy@hellovirginia.com anytime.